Songs are powerful – for many of us they evoke memories and express emotions. However, perhaps most of all, they can be fun! Children are no different. Many children love music and singing – and they usually don’t have the same inhibitions about doing it publicly that many adults have! Songs and music can also be a fantastic tool for teaching all sorts of things to children. 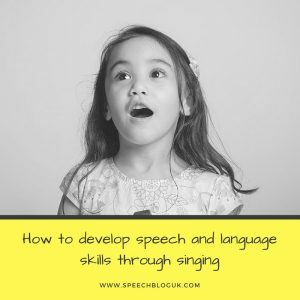 Today, I’m going to look at some of the speech and language skills that we can work on with songs. Most of these ideas are aimed at preschool children. Music can also be a great tool with older children too, but I will save that topic for another day! Joint attention. One of the first pre-language skills that children learn is sharing attention with an adult – both of you engaged in the same thing and focussing on each other. Many children with language difficulties find this difficult. Some simple physical games and rhymes can be a great way to develop this skill with some children. “Row row your boat” and “Round and round the garden”, for example, have fun repetitive actions which involve two people. Hopefully your child will start to anticipate what will happen next and share enjoyment of the rhyme. Requesting. If your child is really enjoying a song, stop at the end, pause and look at them. Will they indicate that they would like you to repeat it? Once they have developed this skill, can they indicate which song they would like to sing, by saying a word or showing you an action? I often put a picture board together for children with a picture to represent each favourite song. Can they give me the picture that represents the song they want to hear? If your child responds better with real objects, you can do a similar thing with a bag full of objects to represent each song. First words. The simple and repetitive nature of songs is a great way to encourage first words. Unlike most of the language that we use, songs are always the same and so they can be a great way to help children remember a word and try to say it in context. One way to encourage this is to stop just before a particular word and see if your child will try to fill in the gap. For example, “twinkle, twinkle, little …” Make sure they are very familiar with the song first. Signs and gestures. Signing and gestures can be a great way of encouraging language generally. Songs are a great way of introducing this, as so many have actions anyway that everyone is doing. Make sure you do the signs and actions for them to see lots of times first. Keep them simple (maybe just a few of the actions to start with). If your child is still reluctant to join in after lots of repetitions even though s/he is watching and engaged, you could try taking their hands gently and doing the actions that way. Alternatively, try pausing to see if your child can fill in the action or getting it wrong to see if they will correct you. Routines. I know of several nurseries or toddler groups which sing a particular song each day at the beginning or end of the session. This helps the children to understand what is happening. At home, if your child struggles with transitions, you could try singing a particular song to cue them in to what is going to happen. Vocabulary. You can use songs to teach any new words. If you don’t know one – make one up! However, there are some songs which are particularly good for certain vocabulary. For example, when I am teaching verbs I often sing “this is the way we wash our hands” (this goes to the tune of “Here we go round the Mulberry bush”). If I’m teaching animal vocabulary I might sing “Old McDonald”. The possibilities are (almost!) endless! Finally, here are some ideas about how to sing songs with children. Don’t be afraid to change songs or make your own up. If the words are too complicated for your child, miss some out. If your child only knows a few words or sounds, use those to make up your own song. The aim is to have fun and encourage participation! Use background music but not all the time! If you are self-conscious about singing or don’t know many rhymes or songs, get a nursery rhyme CD and sing along with it. However, once you have built up your confidence, try to sing just 1:1 with your child. This will help them to really give you their attention rather than the CD. It also means that you can slow down, pause if you lose your child’s attention and say each word clearly for them to hear. Use your child’s interests. If your child is interested in a particular topic – sing a song about it. If you don’t know one, make one up! Don’t worry about mistakes. Your child doesn’t mind if you’re singing out of tune, make a mistake or sing the same line twice. They are just interested in spending time with you and having fun! With slightly older and more verbal children, you could even try making mistakes on purpose, especially with the words. Put in something silly – does your child notice and try to correct you? What other skills do you work on with songs and rhymes? Share them in the comments below.